The all-new 2018 Honda CRF250R proved its dominance in this year’s EXM250 championship as Honda won the manufacturer’s title at the MXGP of the Netherlands. After Redmoto Assomotor rider Mathys Boisrame won the individual title at the previous round in Bulgaria, the Honda CRF250R cemented its position as the number one bike in the class by taking the manufacturers title by over 10 points in this 11 round championship. With the best placing rider for each brand counting towards the points total, it was a real group effort from all the Honda riders to secure this achievement, which included six overall victories, eight moto wins and 14 podium race finishes. Championship winner Boisrame was the main contributor during his highly successful campaign but Apico Factory Racing rider Steven Clarke helped out by winning two races and putting his CRF250R on the podium numerous times as he ended up fifth in the championship. Alberto Forato and Freek van der Vlist also showed good speed during the season and put in valuable results in what was a highly competitive European championship. 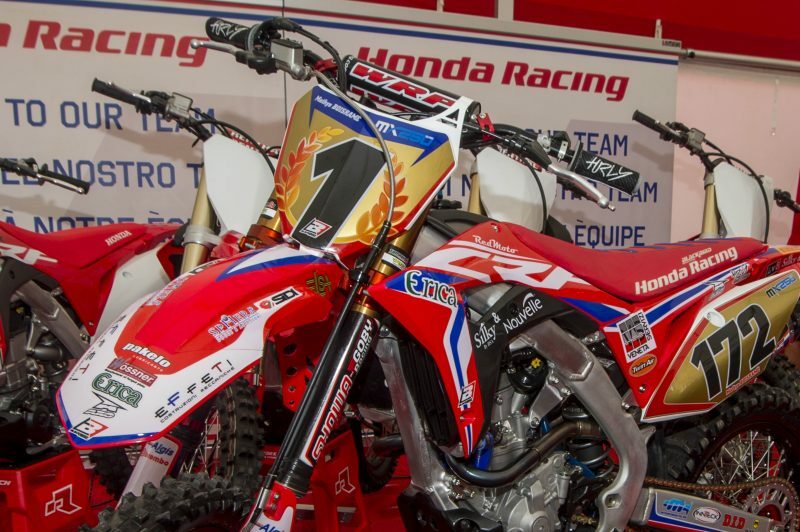 For both Boisrame and the 2018 Honda CRF250R it was the perfect way to round off the season, and with the updated model just unveiled, there is a good chance for another strong season from the pair in 2019.